It's funny I've been sewing quite madly but have nothing to show for it. I guess some weeks are like that. Even though i have nothing great for show and tell, there is another blogger who does. Tara at Just Bergie Boyz is having a giveaway and her prize is a pincushion that has oodles and oodles of character. So be sure to go have a look at her lovely blog. The lovely Sue Daley at Sue Daley Designs is having a pattern/paper piecing give away at the moment. Why not swing by and take a look. I have a new found love for my sewing machine. It has had more use in the last few days then the previous weeks. It helps that it has a (temporary) permanent home in our lounge room. Thank you, Robyn for the wake up call. My mess is now a little less messy. I found that raw edge appliqué and drawing with the machine is not so scary. In fact i am desperate to do some more. My little Birdie is on another bucket thanks to the tutorial by RicRac. At the beginning of this year i had no idea how hooked on blogs and blogging i would be just 6 short months. All it took was a forced hiatus and the habit was revealed. The sigh of relief when our internet connection regained its full health was practically seismic. However, I have put my time to some good use. 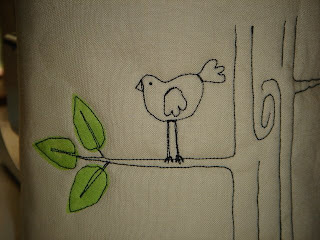 The stitchery is from Anni Downs "Simple Pleasures" book. I had stitched it as part of the Cyber stitching day organised by Karen at Mrs Martins Quilt Shop......BUT in typical fashion i didn't read the instructions and stitched the wrong size Kitty. It did make a good decoration for the little bucket though. Then there is the ( mostly) matching thread catcher from another great tutorial, this time by The Stitching Room. 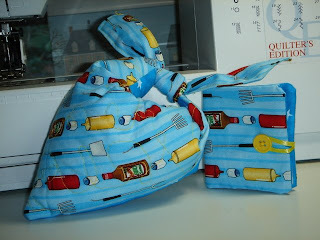 These were made as little gifts for a fellow quilter...........hmmmmm i hope she isn't reading this. 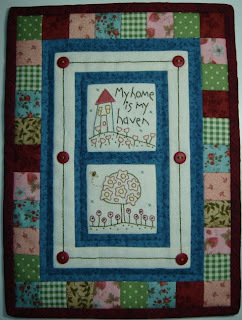 "My Home is My Haven" wallhanging, designed by Anni Downs of Hatched & Patched. This was just one of the cute little projects we had starter kits for on the Stitching Day in June. 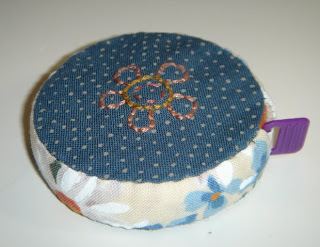 I also received my pincushion from the swap organised by Linda at All Stitched Up. My lovely partner Paula in NH sent me this sweet little pincushion heart and a matching needle case. It is a very pretty in blue. 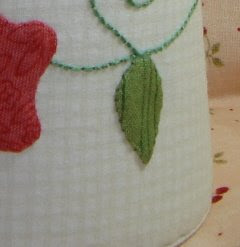 Here is a little sneak peek of my pincushion which i shall be sending off to its new home on Monday. This too will pass ! I had such lovely plans for June. It really was going to be a fun blogging month. We had the Cyber-stitching with Mrs Martin. Pin cushion swapping with Linda. But even the best laid plans don't always eventuate. One of my darling sons exhausted our internet connection to such a degree that blogging was pointless. Pages and pics were taking far too long for my pitiful lack of patience to take. Really, I'm surprised I've made it this far !! Next post things should be back to normal. Then i will be able to give a sneak peek of my pincushion before i send it off to its new home across the sea.